Here you will find products that I recommend for rats and mice. Click the subcategories to view listed products. **For a great online place to buy most of my recommended products as well as many other products please go to www.everythingrats.com! Here you will find our recommended cages for both rats and mice. 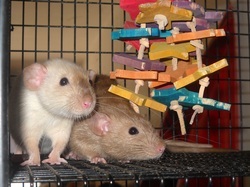 Here you will find our recommended Beddings for rats and mice. Here you will find different brands and formulas of food that I recommend. Anything I recommend for rats on this page would be good for mice as well. TOYS, ACCESSORIES, BED AND MORE! This page has toys, beds, hammocks, cage accessories and more! All of these products are products I would Use myself!